Madrid will use all legal means to stop Catalonia’s secession, PM Mariano Rajoy said, ruling out talks with separatists and vowing to keep federal police in the region, where 800 people were injured in a crackdown on last week’s independence referendum. In an interview with El Pais newspaper on Saturday, Spanish Prime Minister Rajoy indicated that he is not going to back down from his tough stance on Catalonia’s independence, reiterating that until the regional government abandons its intention to proclaim independence, no talks can take place. “As long as it does not go back to legality, I certainly will not negotiate,” Rajoy said, adding that while the Spanish government appreciates proposals to mediate between the national and Catalan governments, it will have to reject them. “I would like to say one thing about mediation: we do not need mediators. What we need is that whoever is breaking the law and whoever has put themselves above the law rectifies their position,” the PM said. Rajoy further said that the national government will do whatever it takes to ensure that an independent Catalonia never happens. “We are going to prevent independence from occurring. That is why I can tell you with absolute frankness that it will not happen,” he said, adding that Madrid is within its rights to “take any decisions that the laws allow us,” depending on the way the crisis unravels. One of the actions that the Spanish government is considering taking if necessary is the enforcement of Article 155 of the Spanish Constitution, which enables the prime minister to dissolve the Catalonian government and call for snap local elections. “I do not rule out anything that the law says,” Rajoy said of the option, adding that there is “no risk at all” that Spain will disintegrate. “Spain will not be divided and national unity will be maintained. We will use all the instruments that the legislation gives us,” he said. 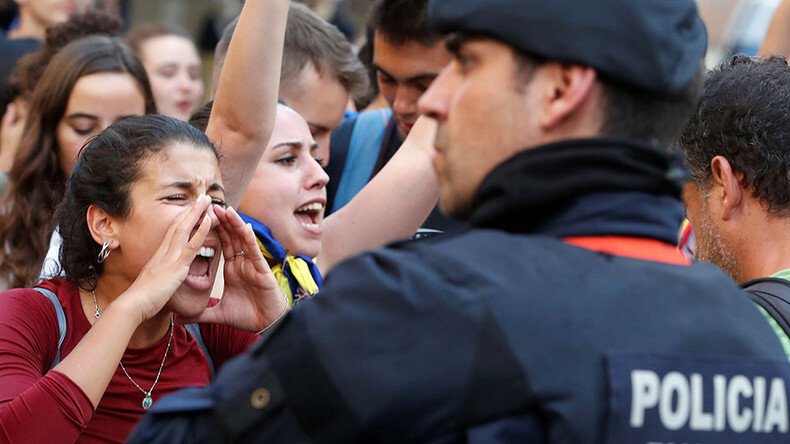 Meanwhile, while tensions continue to run high in Catalonia, the federal police force and the Civil Guard called into the region to deter a referendum that saw a 90 percent vote in favor of a split from Spain are there to stay, Rajoy said. “Look, I am saying that the Civil Guard and the National Police will stay in Catalonia as long as things do not return to normal,” he said, without giving any timeline on the deployment. “The battle of European values is under way and we have to win it,” he said, drawing parallels between such challenges to the European project from populist and separatist sentiments that have been gaining traction in Europe recently. “Populism is everywhere. We have seen what happened with Brexit, there appear characters like [right-wing French National Front party leader Marine] Le Pen, like [prominent UK Independence Party politician] Mr. [Nigel] Farage, like the German extreme right, and in other countries something similar happens. 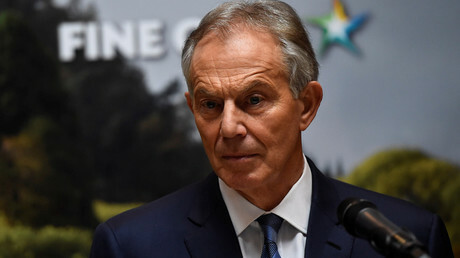 Here we have left the national-populism, which goes against European values, which goes against the rule of law, which goes against the primacy of the law, which goes against respect for the rights of people,” he said. Calling early national elections to defuse the deepening political crisis is not on the table, according to Rajoy, who believes it would send the wrong signal to Europe. 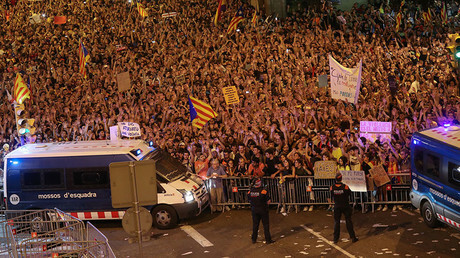 The police crackdown on the independence referendum in the affluent Spanish region on October 1 led to over 800 people being injured and sparked mass protests, with some 700,000 people taking to the streets of Barcelona to vent their anger and voice support for the local authorities. In the wake of the referendum, in which voters overwhelmingly opted for secession from Spain, Catalan regional leader Carles Puigdemont pledged to present the results to the local parliament, despite the Spanish Constitutional Court ruling the referendum illegal. 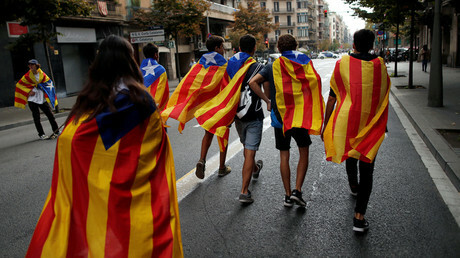 The court subsequently suspended the upcoming Monday session of the Catalan parliament, during which it was expected to address the outcome of the popular vote. Meanwhile, the European Union sided with Spain’s national government, and failed to explicitly condemn the violent suppression of the vote. European Commission First Vice President Frans Timmermans described the baton charges and rubber bullets used against voters and protesters as a “proportionate” use of force that EU states are entitled to deploy to protect the law.